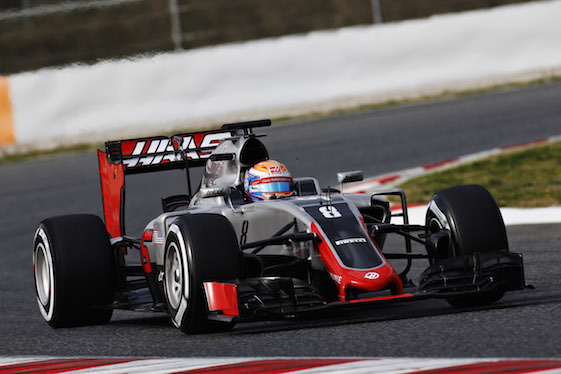 The Haas F1 Team heads to Japan in need of some good news. The Haas F1 Team grabbed and shook the international Formula One scene by its Nomex lapels when it opened its debut season by earning points during the first several races of the 2016 season. The team would like to grab those lapels again as the season heads into its final four races. The team, based in North Carolina and founded by Gene Haas, scored points in the first two events of the season – eight in Australia and then 10 in Bahrain. The team’s drivers – Romain Grosjean and Esteban Gutierrez – would combine to score points again in Russia in May and again in Austria in July. But since then, the team has gone without points. Worse, mechanical problems began to strike the team, which has an alliance with Ferrari, and its cars. Grosjean and Gutierrez both retired with car failures from the Malaysian Grand Prix, the Frenchman suffering a brake problems while the Mexican lost a wheel during the race. Grosjean did not start the previous race in Singapore because of an issue with the throttle. Q: Even though it is Haas F1 Team’s first season and it’s been very productive, is it disappointing to have the kinds of issues you experienced in Singapore and Malaysia come about so late in the year? High-speed stability in regard to mechanical stiffness and aerodynamic balance seem to be the key to success at Suzuka. What do you do to achieve that? Power is another important and obvious aspect to a successful race weekend at Suzuka. You received the most recent upgrade from Ferrari at Monza. How has it performed and how crucial is it to have at a track where we’ll see some of the highest speeds of the season? There seems to be a delicate balance at Suzuka in regard to downforce. Too much and you go slowly down the straights. Too little and the driver won’t have the confidence to attack the track’s twists and turns. Obviously, the level of downforce is predicated on how comfortable the driver is at speed. How do you find this balance between the needs of the car and the needs of the driver? Understeer through the esses between turns 3 and 7 is often at the top of the to-do list at Suzuka. How do you address understeer and at what point does a change to help the car in one section of the track hurt it in another section? With all the investment that goes on in Formula One, is the investment a team has made in its driver lineup perhaps best on display at Suzuka? After Malaysia you had some downtime before you needed to be in Suzuka. Where do you go and what did you do? When you leave Japan you’ll be gearing up for your home race – the United States Grand Prix in Austin, Texas. Where do you want Haas F1 Team to be at that time and what will your thoughts be on that long flight back to North Carolina? This 5.807-kilometer (3.608-mile), 18-turn circuit has hosted Formula One since 1987, with last year’s Japanese Grand Prix serving as the venue’s 27th grand prix. Kimi Räikkönen holds the race lap record at Suzuka (1:31.540), set in 2005 with McLaren. Michael Schumacher holds the qualifying lap record at Suzuka (1:28.954), set in 2006 with Scuderia Ferrari in Q2. The layout of Suzuka is a figure-eight, and it is the only track on the 21-race Formula One schedule with such a configuration. It features every kind of corner, which makes it a favorite among drivers. They can push to the absolute limit even without their cars being stuck to the track via maximum downforce, provided their car is properly balanced aerodynamically. Too much downforce slows the car on the straights, while too little doesn’t instill the confidence drivers need to pedal their cars through the more intricate and twisty portions of the course. Drivers are aided by Suzuka’s high level of grip. The relatively old asphalt abuses tires, as the rough surface provides solid traction. This, combined with high lateral loads through the corners, produces a high rate of wear, which is why Pirelli has brought the three toughest tires in its lineup – the P Zero Orange hard, the P Zero White medium and the P Zero Yellow soft. Crafting the perfect lap is elusive at Suzkua, but extremely rewarding when achieved. DYK? NASCAR staged two races at the Suzuka Circuit in 1996 and 1997. Both were exhibition events that took place at the end of the regular NASCAR season in November. The first race was won by NASCAR Hall of Famer Rusty Wallace and the second race was won by Mike Skinner. In the 1997 event, rain tires were used by NASCAR for the first time in competition, with teams running Goodyear rain tires in practice and in qualifying. The quickest lap at Suzuka in a stock car came in 1996 when Wallace won the pole at a speed of 133.703 kph (83.079 mph) driving a Ford Thunderbird. During the course of the Japanese Grand Prix, lows will range from 14-20 degrees Celsius (57-68 degrees Fahrenheit) to highs of 22-25 degrees Celsius (72-77 degrees Fahrenheit). Relative humidity ranges from 59 percent (mildly humid) to 88 percent (very humid), with a dew point varying from 16 degrees Celsius/61 degrees Fahrenheit (comfortable) to 23 degrees Celsius/74 degrees Fahrenheit (very muggy). The dew point is rarely below 11 degrees Celsius/52 degrees Fahrenheit (very comfortable) or above 26 degrees Celsius/78 degrees Fahrenheit (oppressive). Typical wind speeds vary from 5-26 kph/3-16 mph (light air to moderate breeze), rarely exceeding 35 kph/22 mph (fresh breeze).